Photo supplied by Shirley Cockram, wife of the late John Cockram. Gallantry Award – DFC for Hickey. Front L to R: B/A Bill WOOD, Pilot Ron HICKEY, Nav John COCKRAM. P/O – Hickey; F/O – McClelland. The reverse of the photo (at left) has the crew identification and label "Driffield 1944", as originally written by John Cockram, with himself recorded as "ME". It appears to be summertime, so was probably taken between July and mid-August 1944, during the crew's posting to 466 Squadron, Driffield. The crew's first Op at 462 Squadron, then also based at RAF Driffield, was on 25 August 1944. The same crew photo is also shown in "Brave and True", page 139, labelled as Crew 132 of 466 Squadron, however only P/O R R Hickey (centre front) and P/O R H H McClelland (back, 2nd from right) are named, with the remainder of the crew unidentified. Reference sources – Australian WW2 Nominal Roll; The National Archives of Australia (462 Squadron Operational Record Book); Australian War Memorial; London Gazette; "Brave & True". Photos from the John Crothers Cockram Archives were supplied by, and used with the permission of his wife Shirley Cockram. Crew 9 of 462 Squadron, with a Halifax at RAF Driffield, early November 1944. The aircraft seems to be undergoing maintenance or preparation for an Op. Several of the crew are in dress uniform, so were very well dressed to be departing on, or returning from an Op. By 25 August 1944 when posted to 462 Squadron, McCLelland and Hickey were both Flying Officers; Hickey was promoted to Acting Flight Lieutenant by 30 October 1944; Duchesne had been Commissioned to the rank of Pilot Officer effective 9 September 1944; and Cockram to Pilot Officer in November 1944; Rowe is shown with Warrant Officer rank. 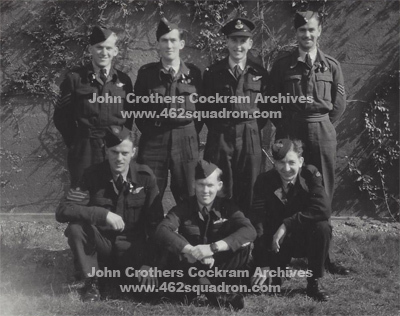 This suggests a date of early November 1944, perhaps the crew's last photos prior to their posting from 462 Squadron after completion of their 1st Operational Tour. The Crew's last Op was on the night 4 November. 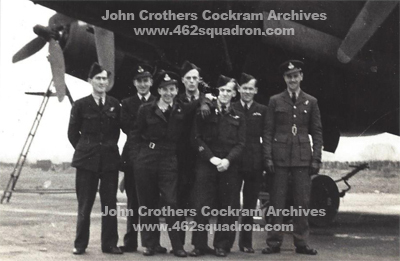 Close-up of photo at left, Crew 9 of 462 Squadron, RAF Driffield, early November 1944. Front, L to R: Nav John COCKRAM, W/OP Lennie ROWE. Crew 9 of 462 Squadron, RAF Driffield 1944, with Halifax showing aircraft Nose Art. The photo had been labelled as "Jane". No Serial Number is in view, nor is any other means of identification visible – often the code letter was above the wheel arch. P/O Lofty Duchesne, F/Eng, with black leather gloves, is shown on the right under the propeller. The others are not identified. The crew man in flying gear (3rd from left) may be from another crew scheduled for an Op in that aircraft. This crew's 2nd last Op on 02 Nov 1944 was in Halifax MZ341 Z5-P. However Brophy's crew was also listed for this aircraft, same Op, but that crew may have been in MZ431(?) (not recorded elsewhere). This crew's last Op was on 04 Nov 1944 in Halifax MZ457 Z5-Y, and for the same Op, Finley and 2nd Pilot Sharp were flying MZ431 Z5-J. The photo may have been taken on one of those evenings. Please make contact if you can identify this Halifax by Serial Number, and Squadron. Close-up of Halifax aircraft "Jane" showing Nose Art, 462 Squadron, RAF Driffield 1944. With the scantily-clad Jane is a row of 9 bombs, which usually indicated the number of Ops for that aircraft to that time. Is this MZ431 Z5-J "Jane" of 462 Squadron, in use from mid-October 1944 to late April 1945? 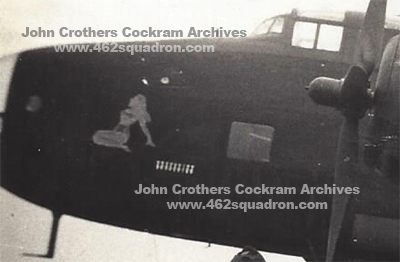 Refer also to photo on Halifax page, but no nose art is visible in that photo for comparison. Crew 9 did not fly any Ops in MZ431 Z5-J. 9. 18 Dec Carthy crew; 10. 21 Dec Marchant crew. Wilson, Finley and Cuttriss had also been posted from 466 Sqdn. Art work is different from that of HX266 HD-J of 466 Squadron, however HX266 was known as "Johnny", not "Jane" refer to Cuttriss crew page; Hickey and crew flew in HX266 HD-J in July 1944 at 466 Sqdn, 2 training flights, and Op 5 to the Ruhr. Art work is different from MZ913 Z5-N "Jane" (aka "Nan") of 462 Squadron, in use from January to April 1945 at Foulsham (also on Halifax page), but Crew 9 was not posted to Foulsham. Additional Crew Information – At the time of writing (late November 2017), none of the Service Files for the six RAAF members of this crew had been digitized by the National Archives of Australia. The UK RAF Service File for Duchesne was also not accessible. Therefore, no information is readily available regarding each individual crew member's training, postings, and the initial crew formation. However information has been sourced from the 462 Squadron Operational Record Book (Forms 540 and 541) from the National Archives of Australia; the Australian World War 2 Nominal Roll (online); various books relating to 466 and 462 Squadrons (refer to Acknowledgements); Facebook page of "Friends of 446/462 Squadrons"; and from the late John Cockram's Archives, including photos and his Flying Log Book. When and where the crew formed and trained at an OTU, and where they trained at an HCU is not yet known by this author. 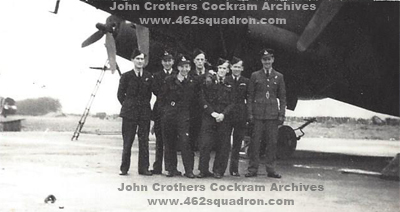 This crew of seven were posted TO 466 Squadron Driffield, sometime in late June or early July 1944. From Navigator John Cockram's Flying Log Book, there were two training flights with Pilot P/O Hickey on 10 July, another on 13 July, and the combined crew's first Op on 17 July (further details in later section). Hickey and Crew 132, of 466 Squadron – Pilot Hickey had carried out his first 2 Ops as 2nd Pilot, then a further 15 Ops with his usual crew. Cockram's Log Book had not counted one Op which was not completed due to an unserviceable motor. The names highlighted below are those who were subsequently posted as a crew to 462 Squadron. Crew details – sourced from "Brave & True", 2nd Edition, 2007, page 140. From the above, F/Eng Duchesne was the only permanent member of this crew who did not complete all of his 15 Ops at 466 Squadron with Pilot Hickey, having been substituted on at least 2 occasions. August 1944 – The Hickey Crew was posted FROM 466 Squadron, Driffield, TO 462 Squadron, Driffield on 20 August 1944 (details below from ORB). The unofficial Crew Number 09 was used by the 466/462 Squadron Association and various authors. 14 August 1944 – Bomber Command advised RAF Driffield that it had been decided to form 462 (RAAF) Squadron at Driffield, with effect from 12 August 1944. 18 August 1944 – certain ground staff personnel arrived, and Flight Lieutenant (Acting Squadron Leader) D E S Shannon was appointed to the Acting Rank of Wing Commander, and was posted from 466 (RAAF) Squadron Driffield to command 462 (RAAF) Squadron, Driffield. 19 August 1944 – Flying Officer D G Highman, RAAF, arrived to take up duties as the Adjutant of 462 Squadron. 20 August 1944 – S/Ldr B J MacDermott and S/Ldr J T Brophy were posted from 466 (RAAF) Squadron Driffield to take up duties as Flight Commanders for 462 (RAAF) Squadron, Driffield, together with 27 Officers included in 14 crews. The Crew's first Op at 462 Squadron was on 25 August, and last on 04 November 1944. Four of the crew was posted FROM 462 Squadron in November 1944, and two in December 1944, having completed their First Operational Tour. The name of Flight Sergeant L Rowe 427663 RAAF was not recorded, but should have been included with the NCO postings FROM the Squadron in December 1944, based on the information in "Brave & True" that Hickey, Cockram & Rowe were posted to 96 Squadron. His progression through the Officer ranks at 466 and 462 Squadron in 1944 can be followed in Nav Cockram's Log book, where Pilot Hickey is recorded initially as Pilot Officer (July), then as Flying Officer (August, September, October); and finally as Flight Lieutenant with the additional responsibility of signing off log books "for Officer Commanding B Flight". April 1945 – 96 Squadron, 1330 Conversion Unit, Bilbeis, Middle East (with Nav Cockram). May, June, July 1945 – 96 Squadron, India and Bengal (with Nav Cockram). After his repatriation to Australia, Hickey remained in the RAAF. 20 July 1947 – Presentation of DFC insignia, his posting then was at 38 Squadron, RAAF, Schofields, NSW. 27 February 1948 – Discharged from RAAF at rank of Flight Lieutenant, from RAAF Station, Amberley, Qld. Saturday 23 September 2017 – Ron Hickey passed away after a short illness. His funeral service was held on Thursday 28 September 2017 at the Landsborough Catholic Church, Queensland. My sympathy is extended to his family and friends. Bomb Aimer William Johnston Wood 419373 enlisted on 18 July 1942 in Melbourne. Navigator John Crothers Cockram 419379 enlisted on 20 July 1942 in Melbourne. With very similar Service Numbers, and enlistment dates and location, it is quite possible that Wood and Cockram trained together as Observers, to later crew-up as Bomb Aimer and Navigator respectively. Cockram was posted from 462 Squadron TO 96 Squadron in early December 1944, along with Pilot Hickey, and W/OP Rowe. Cockram's Second Tour was carried out at 96 Squadron at various locations, transcribed below as as recorded in his Log Book. February 1945 – 96 Squadron, Transport Command, Leconfield, Yorkshire; Pilot Hickey; Halifax III; circuits. March 1945 – 96 Squadron, Transport Command, Leconfield, Yorkshire; various pilots including Hickey; flying Halifax III; local flight from base to St Mawgan's to base; cross country flights. April 1945 – 96 Squadron, 1330 Conversion Unit, Transport Flight, Middle East; Bilbeis, Cairo West, Bilaspur; with various pilots, including Hickey; flying Dakota aircraft; destinations included Heliopolis, Kabrit, Ismailia, Habbaniya, Shaibah, Bahrein, Sharjah, Jask, Jiwani, Karachi. May 1945 – 96 Squadron; Pilot Hickey; Dakota aircraft; Karachi, Nagpur, Bilaspur, Comilla, with a range of other flight destinations in India, Bengal, Burma. June 1945 – 96 Squadron; Pilot Hickey; Dakota aircraft; Bilaspur, Arkonam. July 1945 – 96 Squadron, Pilot Hall; Dakota aircraft; Bilaspur, Bhopal. 03 January 1946 – Cockram was discharged from the RAAF. Wireless Operator Leonard Rowe was also posted to 96 Squadron, and he may have crewed there with Hickey & Cockram. Rowe and Cockram were both discharged from the RAAF on the same date 03 January 1946, both at the rank of Flying Officer, and both at 96 Squadron. 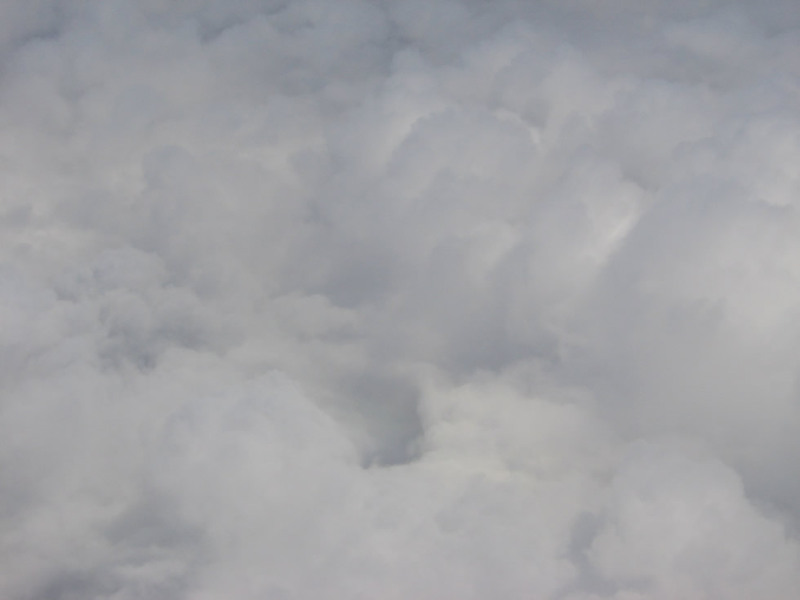 Flight Engineer Leslie Robert Duchesne – nickname Lofty, no doubt due to his height. 09 September 1944 (date of effect) – Sergeant Duchesne, 1602301 RAFVR, General Duties Branch, was Appointed to a Commission at the rank of Pilot Officer, and issued with a new Sce No 184922; published in the London Gazette, No 36780, Tuesday 07 November 1944 (2nd Supplement to London Gazette Issue Friday 03 November 1944). 09 March 1945 (date of effect) – Promotion to Flying Officer, not yet located in London Gazette, but sourced from the Air Force List, July 1945, page 441, Column 1903a: "Flight Engineers, General Duties Branch, promotion to Flying Officer, L R Duchesne – 09 March 1945." Air Ministry 06 January 1959 (page 160) – "The undermentioned relinquish their commissions under the provisions of the Navy, Army and Air Force Reserves Act, 1954, and have been granted permission to retain their rank, as stated, with effect from the date stated." L R Duchesne (184922) 19th November 1958. More information is sought on all members of this crew. If you can assist, please make contact. 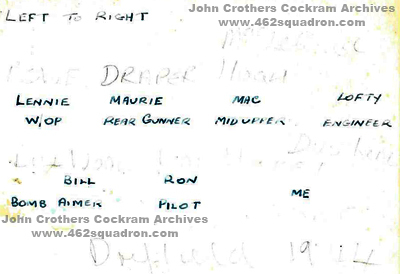 Crew Ops at 466 Squadron – transcribed from "Brave & True", 2nd Ed'n (pages 95 and 140), target names as recorded there. Dates – e.g. 9/10, they departed in the evening of the 9th, and returned in the early hours of the 10th (and so on for other dates). Extra info in the last column has been transcribed from Nav Cockram's Log Book. Day Ops unless noted otherwise. Total Ops for Hickey 17; total Ops for Cockram from his Log book 14 (possibly 15, if 5 August is included). Aircraft identification code for 466 Squadron at Driffield was HD. From the Log Book entries, this crew completed 10 Ops in HX244 HD-O (4 in July, 6 in August with a 7th attempted). The aircraft Serial Number for HD-P was MZ877, and for HD-Z was NR132, as sourced from Brave and True (from text; Table III; Table V; Appendix II). HX266 HD-J – photo on the Cuttriss crew page. 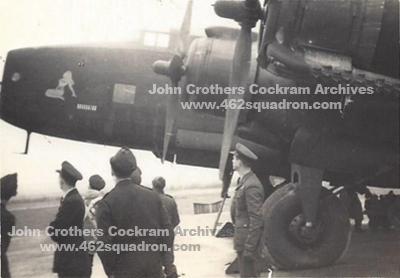 MZ306 K transferred to 462 Squadron – photo on the Halifax page. Crew Ops at 462 Squadron – sourced from the 462 Squadron ORB; additional information transcribed from John Cockram's Log Book. The following table lists the Ops for Hickey and crew – with missions abandoned by Master Bomber; a recall; landing away. These 20 Ops at 462 Squadron brought Hickey's total Op tally to 37; and Cockram's Op Tally to 34. Training and non-Op flights are included from the log book, and are included here. These flights are not usually listed in the ORB. Up and Down times in black are daylight Ops; in red are night Ops. Serial Numbers are from the ORB; Z5 Code from Cockram's Log book (matching known Halifax identification). There were the usual variations in spelling of Surnames, initials, and Service Numbers for crew members. There were 3 Ops with a 2nd Pilot. Except for MU/AG McClelland who was substituted for 3 Ops, and W/OP Rowe for 1 Op, all other members of this crew flew all Ops with Pilot Hickey. McClelland and Rowe did not "catch up" Ops with other crews. Mitchell and Jubb Crews MISSING on this Op. Halifax HX244 O was previously with 466 Squadron, and was in regular use by this crew. Gallantry Award – Distinguished Flying Cross. 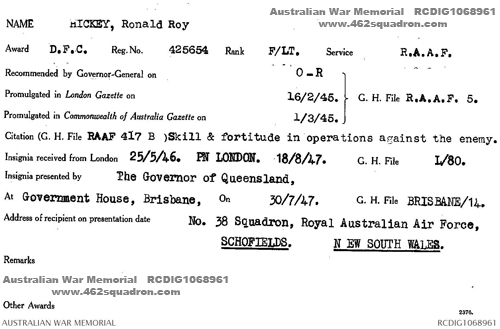 Above: Australian War Memorial card for award of DFC to F/Lt Ronald Roy Hickey 425654 RAAF. The Citation reads for "Skill & fortitude in operations against the enemy". The DFC Award to "Ronald Roy HICKEY (AUS.425654), 462 (RAAF) Sqn." was promulgated in the London Gazette on 16 February 1945, Issue No 36942, page 933 (4th Supplement to Issue of 13 February 1945). The 462 Squadron ORB, Form 540, May 1945, page 84, also mentioned this Award of DFC to F/Lt R R Hickey, along with listings of other Honours and Awards to former members of 462 Squadron, in order to bring the ORB records up to date. The insignia was presented to Hickey on 30 July 1947 at Government House, Brisbane, Queensland. At that time, Hickey's current posting was 38 Squadron, RAAF, Schofields, NSW.